The November 12 botched Israeli military operation in the Gaza Strip is delineating Tel Aviv’s failure to utilize its army as a tool to achieve Palestinian political concessions. Now that the Palestinian popular resistance has gone global through the exponential rise and growing success of the Boycott Movement, the Israeli government is fighting two desperate wars. Following the Gaza attack, Palestinians responded by showering the Israeli southern border with rockets and carried out a precise operation targeting an Israeli army bus. As Palestinians marched in celebration of pushing the Israeli army out of their besieged region, the fragile political order in Israel, long-managed by right-wing Israeli Prime Minister, Benjamin Netanyahu, was quickly unraveling. Two days after the Israeli attack on Gaza, Defense Minister, Avigdor Lieberman, quit in protest of Netanyahu’s ‘surrender’ to the Palestinian Resistance. Israeli leaders are in a precarious situation. Untamed violence comes at a price of international condemnation and a Palestinian response that is bolder and more strategic each time. However, failing to teach Gaza its proverbial ‘lesson’ is viewed as an act of surrender by opportunistic Israeli politicians. While Israel is experiencing such limitations on the traditional battlefield, which it once completely dominated, its war against the global Palestinian Boycott, Divestment and Sanctions movement (BDS) is surely a lost battle. Israel has a poor track record in confronting civil society-based mobilization. Despite the vulnerability of Palestinians living under Israeli Occupation, it took the Israeli government and military seven long years to pacify the popular Intifada, the uprising of 1987. Even then, the jury is still out on what truly ended the popular revolt. It should be accepted that a global Intifada is much more difficult to suppress, or even contain. Yet, when Israel began sensing the growing danger of BDS – which was officially launched by Palestinian civil society in 2005 – it responded with the same superfluous and predictable pattern: arrests, violence and a torrent of laws that criminalize dissent at home, while unleashing an international campaign of intimidation and smearing of boycott activists and organizations. That achieved little, aside from garnering BDS more attention and international solidarity. The war on the Movement took a serious turn last year when Netanyahu’s government dedicated a largesse of about $72 million to defeat the civil society-led campaign. Utilizing the ever-willing US government to boost its anti-BDS tactics, Tel Aviv feels assured that its counter-BDS efforts in the US is off to a promising start. However, it is only recently that Israel has begun to formulate the wider European component of its global strategy. In a two-day conference in Brussels earlier this month, Israeli officials and their European supporters unleashed their broader European anti-BDS campaign. Organized by the European Jewish Association (EJA) and the Europe Israel Public Affairs group (EIPA), the November 6-7 conference was fully supported by the Israeli government, featuring right-wing Israeli Minister of Jerusalem Affairs, Ze’ev Elkin. Under the usual pretext of addressing the danger of anti-Semitism in Europe, attendees deliberately conflated racism and any criticism of Israel, of its military Occupation and colonization of Palestinian land. The EJA Annual Conference has raised Israel’s manipulation of the term ‘anti-Semitism’ to a whole new level, as it drafted a text that will purportedly be presented to prospective members of the European Parliament (MEPs), demanding their signature before running in next May’s elections. Those who decline to sign – or worse, repudiate the Israeli initiative – are likely to find themselves fending off accusations of racism and anti-Semitism. This was certainly not the first conference of its kind. The anti-BDS euphoria that has swept Israel in recent years, yielded several crowded and passionate conferences in luxurious hotels, where Israeli officials openly threatened BDS activists, such as Omar Barghouti. Barghouti was warned by a top Israeli official in a 2016 conference in Jerusalem of “civil assassination” for his role in the organization of the Movement. 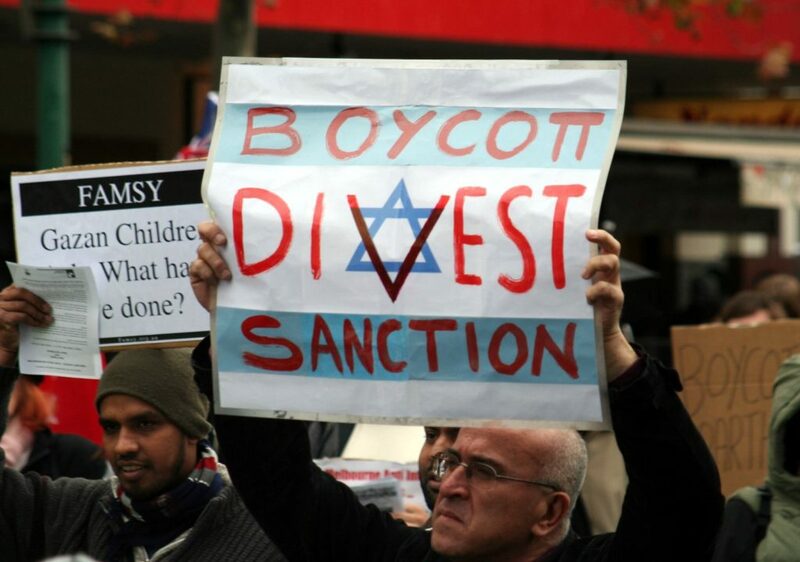 Since the ban went into effect, many BDS supporters have been detained, deported and barred from entering the country. While Israel has demonstrated its ability to galvanize self-serving US and other European politicians to support its cause, there is no evidence that the BDS Movement is being quelled or is, in any way, weakening. On the contrary, the Israeli strategy has raised the ire of many activists, civil society and civil rights groups, angered by Israel’s attempt at subverting freedom of speech in western countries. Only recently, Leeds University in the UK has joined many other campuses around the world in divesting from Israel. The tide is, indeed, turning. Decades of Zionist indoctrination also failed, not only in reversing the vastly changing public opinion on the Palestinian struggle for freedom and rights, but even in preserving the once solid pro-Israel sentiment among young Jews, most notably in the US. For BDS supporters, however, every Israeli strategy presents an opportunity to raise awareness of Palestinian rights and to mobilize civil society around the world against Israeli occupation and racism. BDS’ success is attributed to the very reason why Israel is failing to counter its efforts: it is a disciplined model of a popular, civil resistance that is based on engagement, open debate and democratic choices, while grounded in international and humanitarian law. Israel’s ‘war-chest’ will run dry in the end, for no amount of money could have saved the racist, Apartheid regime in South Africa when it came tumbling down decades ago. Needless to say, $72 million will not turn the tide in favor of Apartheid Israel, nor will it change the course of history that can only belong to the people who are unrelenting on achieving their long-coveted freedom.